Anyone growing fruit trees needs to prune and shape them in order to help the tree develop a good branch framework for fruit. There are several fruit tree shapes you can use as a model when you prune to help you get a great harvest. Many gardeners have trouble understanding fruit tree forms and how to achieve them, however. 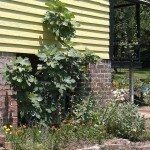 If you want to learn about the different forms for fruit trees, read on. We’ll also give you tips for pruning fruit trees. You should train and prune your fruit trees every year, but it’s an easy job to procrastinate, especially if you don’t understand the how’s and why’s of different fruit tree shapes. But if you don’t shape your trees, they won’t give you high-quality fruit. A tree left to its own devices will grow tall and broad. Ultimately, its dense upper canopy will shade out most of the fruit on its lower branches. As trees mature, fruit will only appear at the branch tips unless you prune them into appropriate forms for fruit trees. A primary reason to start pruning fruit trees is to develop strong fruit tree shapes. The correct forms for fruit trees not only encourage fruit production, but also keep the trees shorter to make harvest easier. Appropriate pruning creates an open branch structure that allows sunlight to enter. 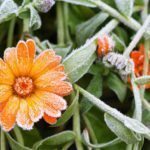 This kind of light penetration is essential to allow flower buds and fruit to develop. Proper shaping also allows air to pass through the tree canopy, encouraging quick drying to prevent disease. When you start pruning fruit trees regularly, you have a chance to trim out broken, damaged or diseased branches. Working to create appropriate forms also makes the trees aesthetically pleasing. You’ll find a number of different fruit tree forms in articles about training trees. While you can choose any appropriate form, the two seen most often are the central-leader and the open-center forms. Espalier is another commonly used form. 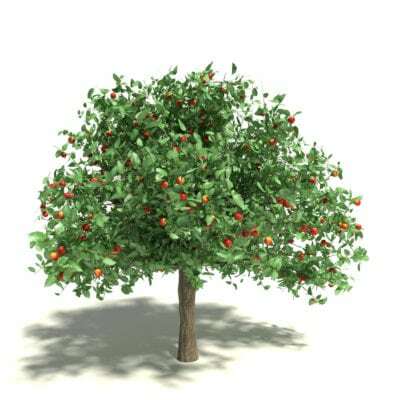 The central-leader fruit tree form is used frequently for apple, pear, pecan and plum trees. It is characterized by one principal trunk, also called a leader. With a central-leader tree shape, you remove all branches on the lower section of the trunk, allowing the branching some 3 feet (1 m.) above the soil level. Each year, you allow four or five branches to develop, evenly spaced in a whorl around the tree. As the tree grows, upper whorls are pruned shorter than lower ones, so that all get adequate light. The other primary shape among the different fruit tree forms is called the open-center form or vase form. It is used for peaches, nectarines and plums. In the open-center fruit tree shape, the central leader is removed by pruning. That leaves the tree without upright growth in the center. Instead of a central leader, this form fruit tree has several major branches coming out of the trunk, allowing in ample sunlight. 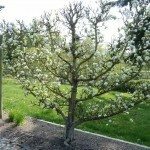 One artistic form for dwarf apple or pear trees is called the espalier. An espalier form is a flat, two-dimensional tree shape against a trellis or wall. Trees shaped to an espalier form have an upright trunk and multiple horizontal branches on each side. The branches are attached to the support and allowed to grow in all directions other than out. The support protects the tree branches as well as giving support.